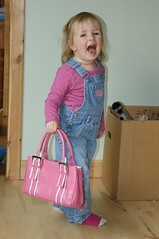 Auntie Amanda gave me her old pink handbag. It is the most beautiful bag I've ever seen. I have put some toys in it. Mummy says she knows just the car I should buy to go with it. She saw it at ASDA last night. Mummy also says she thinks I might be Prime Minister one day because she says I remind her a bit of Margaret Thatcher when I walk about holding my pretty bag. Mummy looks a bit worried when she says this and asks me to promise I won't be a Tory Prime Minister - whatever that is!